When I was growing up, we lived in a small town about fifteen minutes from a much larger town, and about 30 minutes from an even bigger area where the mall and alot of good restaurants were. So, naturally, if my family wanted to go out to eat and not just go to the local family-owned places in town, we would go either south into the next county, or north to the next town over. One of our favorite places to go when I was growing up, and a place we went to until I was probably about twelve years old was a buffet/steakhouse hybrid called Ponderosa. The food was (from what I remember) good, and we went there pretty regularly. I’m not sure when it actually closed, but when it did (I think I was in my early teens at this point), a Chinese buffet took over that location. If you went there (and again, we did regularly), you got the “Ponderosa vibe” (coined by an ex-boyfriend who always looked forward to going to the Chinese buffet) from the location. 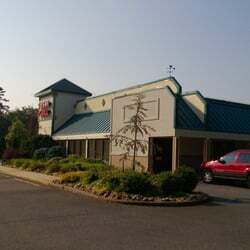 The layout of Ponderosa remained as this Chinese restaurant took over. I always remember that particular restaurant being well-lit, clean, and overall just a nice place. I’d been to a few former Ponderosa locations that didn’t look nearly as nice, or were as well-lit, but still kept up the same layout and buffet-style service. Ponderosa was established in 1965 by Dan Lasater, Norm Wiese and Charles Kleptz in Kokomo, Indiana. The restaurant later moved its headquarters to Dayton, Ohio. The company expanded into Canada by the early 1970s, but by 1986, the United States proved to be a more viable place for expansion, resulting in most Canadian locations closing. 36 locations in Canada became Red Lobster restaurants after they were purchased by General Mills Restaurant Group. By 1997, Ponderosa had united under the same management group as a similarly-themed steakhouse, Bonanza (I remember those too! ), and locations operate under either name, but on the same concept. In 2008, the chain’s parent company, Metromedia Steakhouses Company (which had owned Ponderosa since 1988), filed for bankruptcy. After emerging in 2009, the company was named Homestyle Dining LLC. At this time, 88 locations still operate around the world, with 63 of them in the United States. Poor Canada, they no longer have Ponderosa (or Bonanza) locations. In fact, the closest ones to me are about a four-hour drive away, in Western Pennsylvania. But hey, if you’re ever in Puerto Rico, Egypt, Qatar, Taiwan, or the United Arab Emirates, and are craving a steakhouse feel with Old West flavor (or just a salad bar), there are options! Ponderosa Commercials…Make Yourself At Home! …and watch these commercials from the height of the restaurant chain’s existence! Locations in Canada may have closed up, but apparently, these Nova Scotia locations survived! …Look no further than the Ponderosa/Bonanza menu! Have You Been to Ponderosa (Or Bonanza)? What do you remember most about the food, atmosphere of their restaurants, or even the commercials? Did you get ice cream from the Sundae bar, tackle the buffet line, or order from a menu? For me, it was the one place I drank Dr. Pepper (unlimited refills!!! ), and I always ate from the buffet! Next Post For Feminine Hygiene…Use What?! I used to eat at various Ponderosa restaurants in the Pittsburgh area whenever I was younger. Sadly, there are almost none of them left. There was one in Bridgeville many years ago … and, until recently, there was one in Washington, PA. Sadly, both of those Ponderosa Restaurants are gone. Before the more modern one closed by me, it became the New York Steakhouse and Buffet. It was literally Ponderosa, but with a different name. The owner said he didn’t want to pay the franchise fees anymore, so he just changed the name, but everything else stayed the same (including the menu). Once he got rid of the Ponderosa name it went out of business quickly. I think people were going there just because it was a Ponderosa and they hadn’t been to one in years. I know that’s why I went. And that would be why I would go!!!! We used to go there regularly as well, but our location was closed by the early 90’s. I remember it always being a little dark in there (most 70s restaurants were). Everything was dark wood and had that cabin feel. There was a much more modern Ponderosa near where I live now, it closed a couple of years ago and is now a sports bar. I went a bit before it closed and you could tell it was dying. It had a very 90s vibe with the dark green carpet and booths and brass fixtures and the big long salad bar with huge sneeze guard.